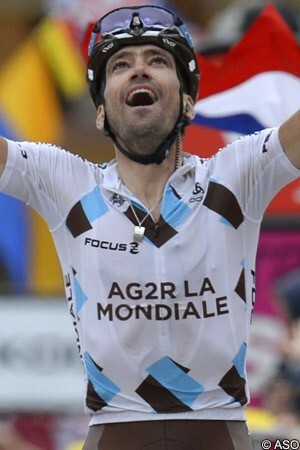 Christophe Riblon (AG2R La Mondiale) managed to hold onto the form that saw him take the “Double d’Huez” stage of the Tour de France two weeks before as he won the second stage of the 2013 Tour of Poland, between Marilleva Val di Sole and the Passo Pordoi. The French climber broke clear of a breakaway group of six riders that had begun the famous climb together, then held on to take a solo victory on the 2239 metre high Dolomite mountain pass. Thomas Rohregger (RadioShack-Leopard), who was the last rider to be dropped by Riblon with just over eight kilometres still to climb, held on to take second place, a minute and one second behind the Frenchman. Georg Preidler (Argos-Shimano) just managed to hold off the chasing pack to take third place, 1’18” behind Riblon, with Sergio Henao (Team Sky) taking fourth place 1’35” back. In fifth place, however, in the same time as Henao, was Rafal Majka (Saxo-Tinkoff), who started the day in third place but took over the yellow jersey from stage one winner Diego Ulissi (Lampre-Merida), who had been dropped by the peloton. “The stage was very hard and It was a long day," said Riblon. "I was always in the lead break. It wasn't easy. In the final there was a lot of wind and in the last kilometers you could really feel it. Domenico Pozzovivo and I are the leaders of the team here at the Tour de Pologne, we'll see how it goes in Poland. The 206.5km stage had originally seen a 16-rider break go clear in the early kilometres, but steadily reduce as the race took on the climbs of the Passo Pampeago and Passo Costalunga in the second half. By the time the leaders hit the 13km final climb to the Passo Pordoi they were down to just six riders. With Riblon, Rohregger and Preidler were former cyclocross World champion Zdeněk Štybar (Omega Pharma-Quick Step), Maciej Paterski (Cannondale) and Tomasz Marczynski (Vacansoleil-DCM). Marczynski was the first to try to escape the others, but was countered by Paterski; Riblon accelerated and caught the Polish rider, however, with Rohregger in tow, and the two of them rode clear. With just over eight kilometres to go, however, Riblon attacked again, leaving Rohregger behind, and the Frenchman continued alone to the finish. For some minutes Riblon, who started the day 2’07” behind Ulissi, was the virtual race leader, until the front of the peloton accelerated in the final kilometres. Majka took the yellow jersey with a slim lead over Henao and Riblon, meaning that a Polish rider was in the lead as the race headed towards Poland for stage three. The very first kilometres of the stage saw the 16-rider breakaway form. With Riblon, Štybar, Rohregger, Paterski, Preidler and Marczynski were Giro d’Italia champion Vincenzo Nibali (Astana), Štybar’s Omega Pharma-Quick Step teammate Serge Pauwels, Marczynski’s Vacansoleil-DCM teammate Bert-Jan Lindeman, Bruno Pires (Saxo-Tinkoff), Arnaud Courteille and Sandy Casar (FDJ.fr), Nikolay Mihaylov (CCC Polsat-Polkowice), Bartosz Huzarski (NetApp-Endura), Danny Pate (Team Sky) and Angel Madrazo (Movistar). The group was allowed to steadily build a lead over the peloton, but it was to peak at just 5’30” at the 104km point, with Huzarski taking the first intermediate sprint, in Fondo-Val Di Non after 40km, Madrazo taking the second, in Cembra after 95km, and Huzarski taking the third, in Cavalese-Val Di Fiemme after 120km. Shortly afterwards, however, the group began to split as it began the first of the day’s three big climbs. Huzarski, Madrazo and Pauwels had continued their efforts immediately after the sprint, which saw the group’s number cut to eleven. An attack from Nibali on the Passo Pampeago slashed the group even further, as he was first joined by Marczynski, then Rohregger, then finally by Štybar, Riblon and Mihalov. Preidler and Paterski were chasing hard a little way back, and managed to join the leaders on the Passo Costalunga, where Nibali was dropped by what had become the final six riders over the top of the climb. Lampre-Merida had been leading the peloton all day but, with Ulissi struggling, the Colombia team of second place overall Darwin Atapuma took over. Once Mihaylov was caught the CCC Polsat-Polkowice team set to work to chase down the remains of the break, however, but it was Movistar that hit the front as the final climb began, with the break now just 2’30” ahead. With 11.5km to go Marczynski jumped clear, but Paterski reeled in his compatriot and left him behind. Rohregger and Riblon steadily reeled in the Cannondale rider in the course of the next kilometre, however, with the Frenchman hitting the front immediately and pulled the three-rider group along. Under the ten kilometre banner the trio was 15 seconds ahead of the other three but, as Riblon accelerated again with 8.5km to go, Paterski was dropped and he dropped back towards the attacking Preidler. Saxo-Tinkoff was now leading the much-reduced peloton, just 1’44” back but, just before the eight kilometre banner, Riblon attacked again and left Rohregger behind. With six kilometres to go Riblon was 15 seconds ahead of the Austrian, while the peloton was now 1’56” behind and drifting backwards again. In the next kilometre the Frenchman had pulled that lead out to 27 seconds over Rohregger, with the peloton - apparently having sat up a little - now at 2’17”. Rohregger was still the yellow jersey on the road, having started the day 1’33” behind stage one winner Diego Ulissi (Lampre-Merida), who was no longer in the peloton. Riblon was just 34 seconds behind the Austrian overall, however, and was inching towards taking that time back. The RadioShack-Leopard rider was resisting, but Riblon was still climbing strongly into the final kilometre. As he had done on Alpe d’Huez two weeks before, Riblon waved his team car back so that he could aim at the apex of the corner, but took a “low-five” instead. Staying in the saddle all the way up, the Frenchman finally sat up as he hit the line and punched the air with both hands as he took the victory. Behind Riblon, Rohregger was beginning to struggle in the final kilometre, and eventualy crossed the line 1’01” back, and conceded his lead to the Frenchman. Preidler had rallied in the closing kilometres, and almost managed to catch the Austrian rider, but took third place 1’18” back. Henao led the peloton sprint across the line not far behind Preidler, and 1’35” behind Riblon, with Majka taking the yellow jersey over from the absent Ulissi.